Many rumors spread around in Pakistan about the launching of automobile cars companies in 2018 which includes Kia, Hyundai, Renault and many others but the news are yet to be confirmed about the launching date of upcoming cars in Pakistan 2018-19. So to include all cars that are not expected to launch in 2018-19 would be unjustified. Therefore the list of upcoming cars in 2018-19 include only the confirmed or announced. Confirmation or announcement include all platform such as auto show, official Facebook page or direct company representative statement. Ghandhara a partner of Nissan in Pakistan announced to relaunch Nissan brand in Pakistan in late 2018, initially they decided to launch small size compact cars in Pakistan to compete and value to the consumer with the latest Specs and technology. These two models have been decided to launch as soon as they get the permission from the government of Pakistan, According to Ghandhara representative in auto show Pakistan 2018, they expected an approval certificate of Greenfield status within a few weeks. DFSK is a Chinese automobile company operating in Pakistan about a year ago, they are selling mini/LCV vans, Recently DFSK partnered with regal auto industries a maker of Road price motorcycles announced to assemble locally in Pakistan all of the DFSK vehicles available in Pakistan, in addition they also announced to launch another brand of DFSK on the name of Road Prince Glory 580 SUV within a few months after some unfinished work to be done. Announced by the Road Prince representative in Auto Show 2018. Nishat assembly plant will be completed by the end of 2019, according to official Nishat Motors Pakistan the locally assembled vehicle cannot be expected in 2018, Nishat also indicate a completely built Unit as called CBU might be launch in the late 2018, No confirmation of what model they launch but more likely of Hyundai Tuscan or Nexa. Still unconfirmed about the date and the model to launch in Pakistan, No news or announcement be made by the Renault Pakistan. However more probably of launching a mix of two version a small size compact and a Suv crossover. 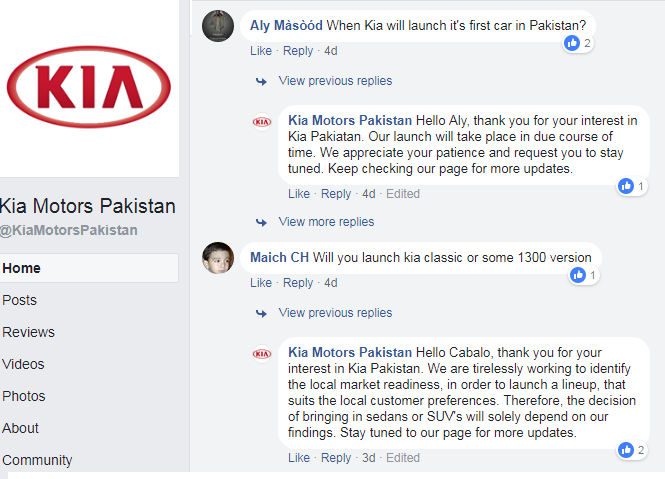 Kia are still undecided of which models to be launch in Pakistan, Production of Local assembly of vehicles will be start in the mid of 2019. In addition according to the Kia Lucky representative they are not disclosing any information about expected model and date to launch. Toyota already launched an updated version of Corrolla altis, Revo and Fortuner with the new features and specification. Toyota clearly stated of no new model of Corolla Gli, Vios and Yaris will be launch in this year 2018.